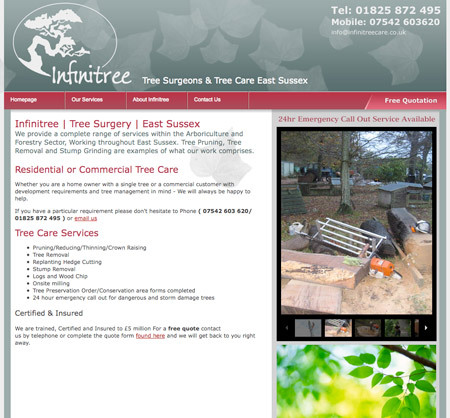 Rob from Infinitree came to us to design a website for his new start tree surgery company based in Chiddingly East Sussex.Rob had everything ready for us to make a start on his website. Was nice to have all the content and imagery ready for us to work our magic. We wish rob and Infinitree the best for 2010 – 2011 and hope business thrives with the help of the new website. If you need a tree surgeon in Heathfield or tree care Uckfield why not give them a visit.